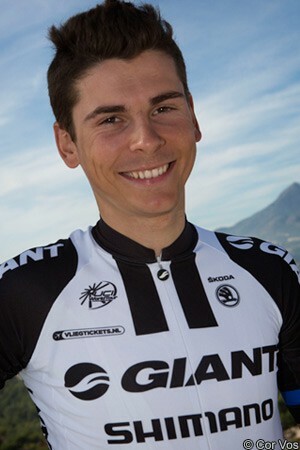 Two time Vuelta a España stage winner Warren Barguil and dominant women’s rider Kirsten Wild are amongst six Giant-Shimano riders who made gains when the team held an aerodynamic testing day recently. The Giant Shimano team brought eight riders to the track in Apeldoorn recently, namely Barguil, Wild, Lawson Craddock, Tom Dumoulin, Chad Haga, Tobias Ludvigsson and Georg Preidler. They were using the Giant Trinity time trial bikes and did a programme of riding on the track at six set speeds. Power wattage was measured to determine the work each rider did to achieve those speeds. Changes were then made to their position in order to see if gains could be made. Most of the riders were able to find faster positions, which should translate to gains against the clock in races. “The track testing day was really productive for everyone and six out of eight of them made improvements to their position and power output which will mean quicker times when racing,” said science expert Teun van Erp. Some of those gains were made in equipment rather than position. “With some riders we won a lot and others we barely changed their position,” said technical research and development expert Tom Davids. “For example Warren already had a very aero position so we tried a different shaped Uvex TT helmet which suits him better when in an aero position. “For Tom D [Tom Dumoulin – ed.] we copied his position over from last year’s bike to the new Giant Trinity and after testing different changes we ended up adjusting his bar height slightly, gaining him some watts. Ludvigsson reaped the benefits of the work on Sunday when he won the final time trial at the Étoile de Bessèges and, in doing so, also took the general classification.